One could hardly believe, that there is a peaceful haven in the heart of the vibrant metropolis with more than 1 million inhabitants. But there is – and more than one. 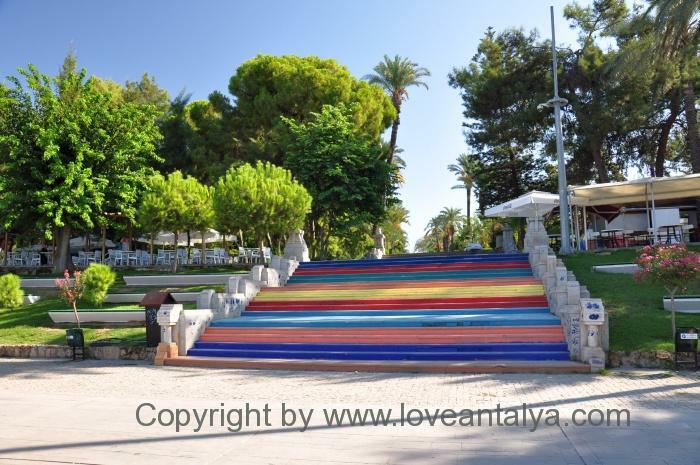 However, the Karaalioglu park is one of the most beautiful parks in Antalya, and I really enjoy coming here. There are only very few places in the city, where you can find peaceful breathtaking holes like this one. Places where you can take a break from the city, have some air, enjoy the view and the beautiful scenery. Unfortunately, the park is often overlooked by tourists – and it’s a real shame. Because it is special. .In the park there is room for a little of each. 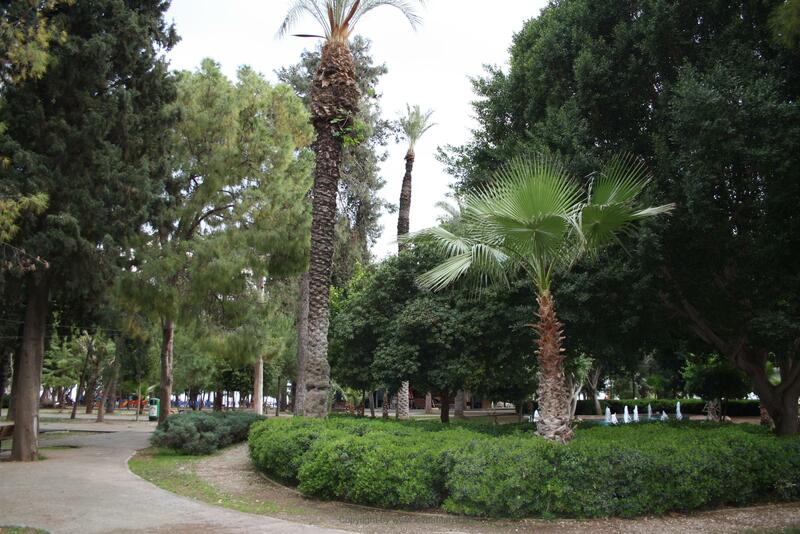 There are several paths and large alleys, where you can stroll or sit in the shadow of the impressive big palms, enjoy the beautiful flowers and the many exotic plants. 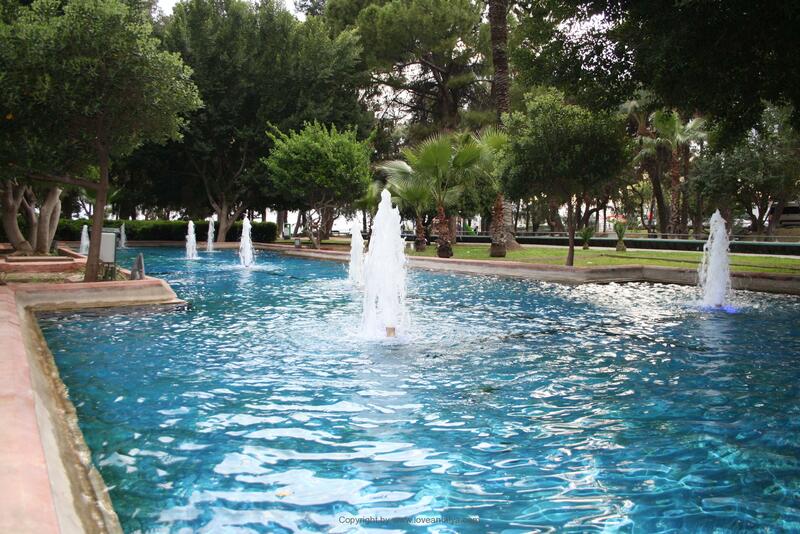 There are several fountains, that contribute to a cool feeling, when you enter the park on a hot summer day. If you are lucky, there will also be a cooling breeze from the Mediterranean sea. Something that is really appreciated and helps make the park a favorite place for many of the locals. Here you can relax, enjoy the nature and have a break from everyday life or just enjoy your lunch in the middle of work and after school. 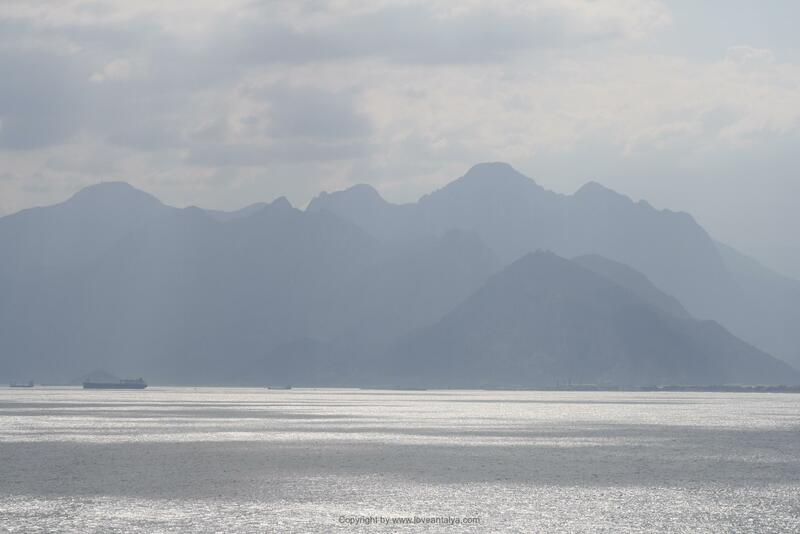 The Karaalioglu park is undisputed the place in Antalya, where there is the most beautiful view over Antalya bay. If you stand in the right spot, you can enjoy the impressive mountains on the horizon, the beautiful old harbor with the lively traffic of bigger and smaller boats on their way in and out, the vibrant city in the background, and at the same time hear the glaring sounds of the fountains, while sitting in front of the old Roman monument Hidirlik Kulesi. That’s quite unique. The park is the place to take your holiday pictures. Here, at least, there is ample opportunity to get the perfect “postcard pictures”, almost wherever you go. 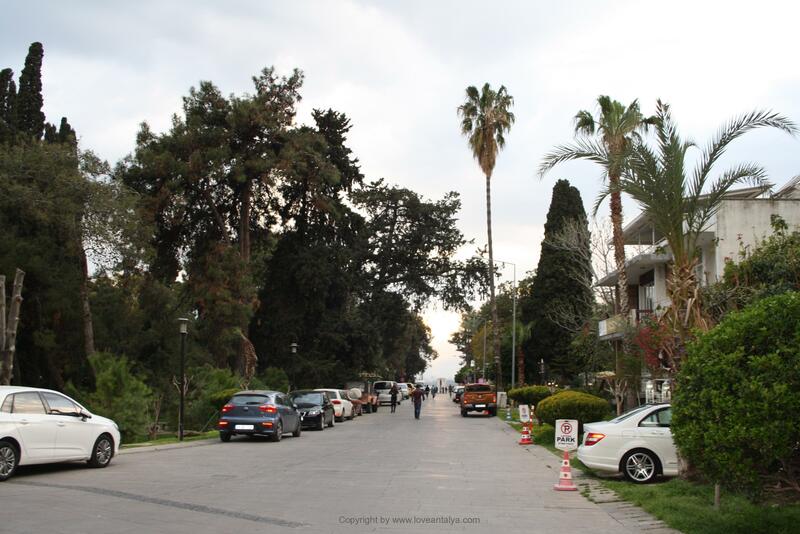 The great avenue that leads from the city and the hectic “Palmstreet”, the big shopping street, into the park, opens into a large space and the most beautiful view one can imagine across the Mediterranean. Here is the time and space to stand and enjoy the nature, watch the tourist and fishing boats cradled in the sea, looking at the many beautiful mountains that surround the city with the tiny towns , spread scattered for the foot and up and down the slopes. 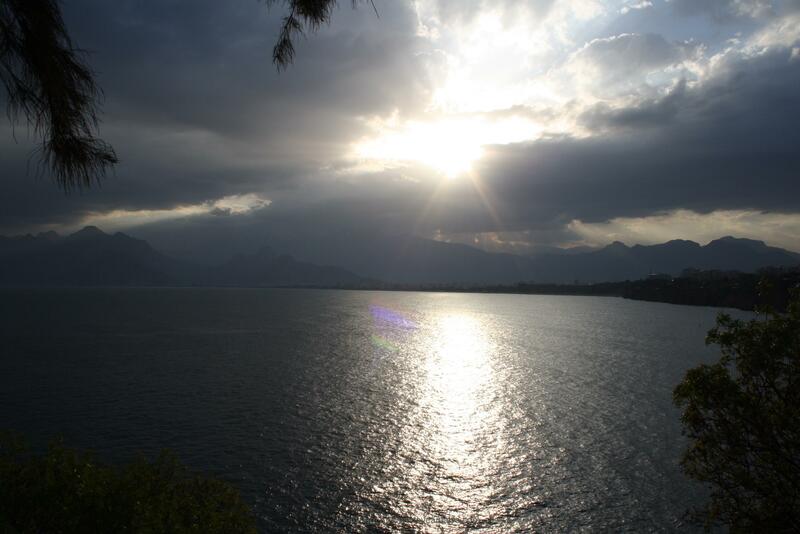 And the Karaalioglu park is definitely the place to enjoy the sunset behind the mountains. I love to come here especially at the end of the day, where the atmosphere is very special. The street vendors and the artists are switching to the evening’s nightmares, the many small cafes prepares for the evening guests, the children play with their parents in the playground, the many youngsters – finally released from a long and hot day at the school is strolling around, taking pictures and looking at each other, some individuals may try the obligatory outdoor fitness machines (found in almost all parks in Antalya). But standing here at the end of the street, notice the heat rise a bit after a hot day, hear the sound of the many singing cicadas and watch the sun go down behind the mountains, and the thousands of little flashing lights from the villages starting to emerge, is – in my world, the best at all. Here you will relax and have the opportunity to just be and enjoy. 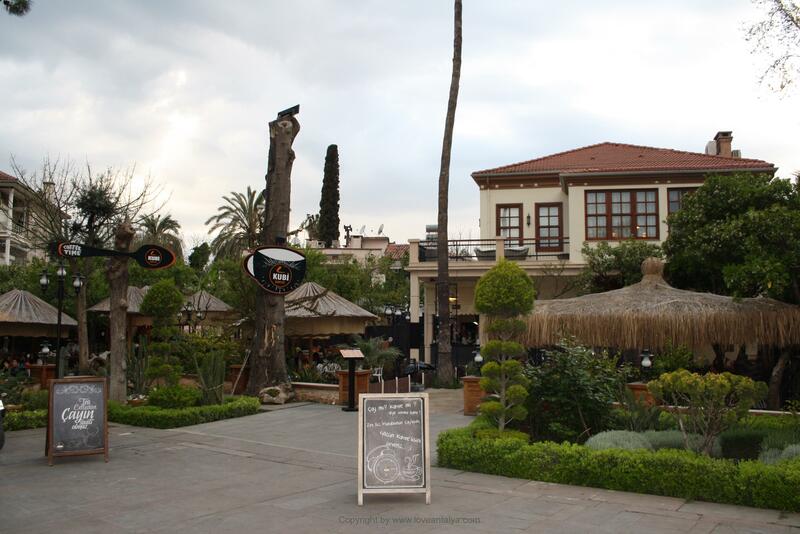 There are several eateries and small cafes in the park – virtually everyone with outdoor dining and entertainment. I have never eaten dinner here (or lunch for that matter), but it seems to be a popular place for both locals and tourists. In the evenings there is often music, light show, theater and street artists, and the range of food (and drinks) is great. 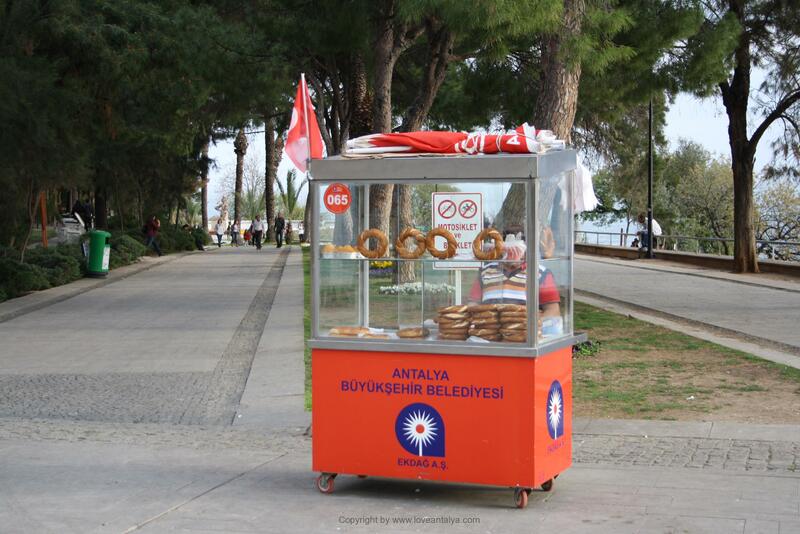 If you only have something fast during the day, there are several small street vendors, including the ones that sells the popular Simit bread. You can enter the park by several roads. Either behind the cultural house, at the grand avenue at the theater on the corner of Atatürk Caddesi and Işıklar Caddesi (which I so poetically call “Palmstreet” – guess why …?) Or by the small hilly, steep streets of Kaleici. I can only recommend you to take a trip here, if you are in town. I’m sure you will not regret it. 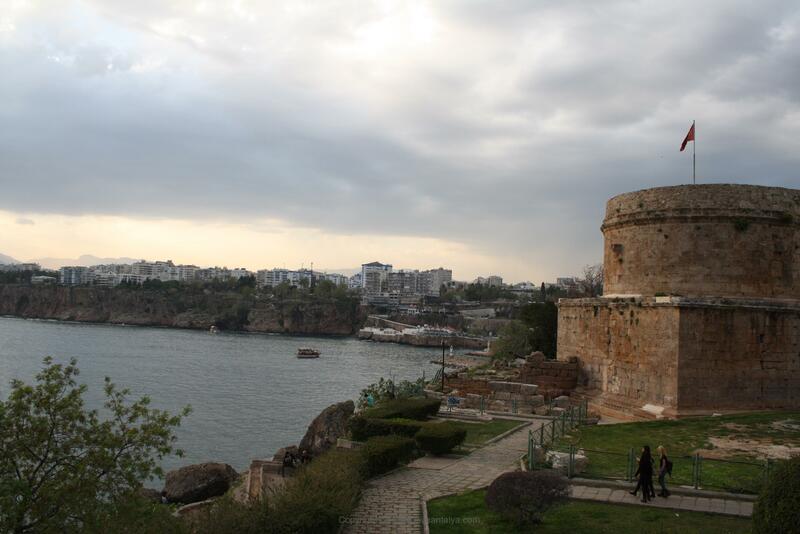 A trip to the Karaalioglu park is easy to combine with a trip to the Old Town and the harbor and is close to several things like the big shopping street, the Ataturk Museum, the City Museum and the city’s landmark, the fine old Yivli minaret.